For the Pink Sands Beach Bahamas of Harbour Island to be considered one of the very best beaches in the country, it would need to be a truly exceptional destination. The Bahamas is a destination known almost entirely for its exquisite beaches and coastal scenery, which means that a beach like Pink Sands Beach Bahamas is not only one of the best beaches in the country, but in the world. The attractions, scenery and general appeal of Harbour Island Bahamas is undeniable. This has resulted in it being on of the most treasured hidden gems of the Bahamas Out Islands. It is delightfully uncrowded, and the few people that make their way here each day will find themselves in complete paradise. Harbour Island is one of the Bahamas’ greatest vacation destinations. Truthfully, this fact is not entirely surprising when one sets foot in Harbour Island Bahamas. There is nowhere quite like it. Stunning english colonial buildings are framed by swaying palm trees and flower beds simply overflowing with color. Panoramic vistas and countless new experiences to discover wait around every corner. The charm doesn’t even end there, as the sound of the soft breeze and the gentle rhythm of the waves will be all that falls on your ears. No cars can be found on Harbour Island Bahamas, only golf carts, bicycles and people enjoying the endless beauty that the Bahamas has to offer. Though Harbour island certainly has a lot to offer in the way of attractions and sights, few compare to the beauty, or popularity of the famed Pink Sands Beach Bahamas. There are a number of things that set this destination aside from all the other beaches in the Bahamas. All of which combine together to create one of the world’s most memorable destinations. To start with, the most obvious and unique aspect of this beach is of course, the colour of its sand. As the name suggests, the turquoise blue waves of the Bahamian ocean roll onto pink sand, and not the iconic white of most other beaches in the Caribbean. Pink Sands Beach Bahamas is one of very few beaches in the world that display this pink hue. Some might consider this to be somewhat trivial, but those are yet to view the beach in person. Leaving a string of pink footprints in your wake as the sun sets over the rolling turquoise water is an experience that absolutely everyone who visits the Bahamas should enjoy. Though there is still plenty more to discuss about this destination, an explanation for the color of this sand is due. Curiously, it is not, in fact, the sand itself that is pink, but rather that the white grains are mixed in with millions of microscopic red shells. These shells once belonged to Foraminifera, which are the most abundant single-celled organisms in the ocean. What the more observant traveller may notice, is that the pink color becomes stronger near the water’s edge. This is due to the fact that the shells display a much brighter red when wet. The red of the shell and the white of the sand blend together to display the pink color that has brought in travellers from around the globe. The scenery is made more beautiful by the verdant greenery lining the shores. Palm trees cast dappled shade onto the pink sand. The palm fronds sway in the gentle breeze that rolls off the turquoise waves. The fresh scent of the ocean mingles with thousands of flowers across Harbour Island Bahamas. The rays of the sun dance playfully on the surface of the water and birdsong carries through the air. This destination truly feels like a fantasy, the idyllic atmosphere will make you feel as if you have been transported directly to paradise, and really, you have. Of course, there are few destinations in the Bahamas, or even the world that are better for a range of fantastic vacation snaps. Pink beach Bahamas stretches on for upwards of 3 miles, and ranges from a 50-100 ft width. A busy, crowded beach would see this space filled in a matter of minutes, but in the Bahamas Out Islands, you could well be the only person or party on the beach. This enormous expanse of immaculate Bahamian nature is your playground and photo studio. You will come away with hundreds of unique pictures and even more unforgettable memories of one of the world’s most beautiful destinations. Where is Pink Sand Beach? Many people ask the question: “Where is Pink Sands Beach?”. Well, the simple answer is that it is on Harbour Island in the Bahamas, however there are a number of better-known landmarks around the island that may give you a better idea of where it is exactly. Many Eleuthera Bahamas tours offer a chance to visit Harbour Island and Pink Sands Beach Bahamas, and a short trip from the North Eleuthera Airport will bring you to a boat that will take you directly to Harbour Island and the vacation of your life. Of all the sights to see on Harbour Island, Pink Sands Beach Bahamas is undoubtedly the best. In fact, you’ll struggle to find a more beautiful scene anywhere, whether you’re just in Eleuthera Bahamas or you’re doing a tour of the Out Islands as a whole. Pink Sands Beach Bahamas wouldn’t be the perfect Bahamian getaway without some truly spectacular accommodation. Undoubtedly, the bed you’ll be wanting to sleep in will be one in Pink Sands Resort. This magnificent site can be found in amongst lush green gardens and trees that border Pink beach Bahamas itself. The resort emanates luxury and comfort from every surface, providing the ideal, relaxed atmosphere to come back to after a full day of exploring Pink Sands Beach Bahamas and a number of the other exciting sites on Harbour Island. Pink Sands Resort is more than just a place to lay your head, though. Some of the very best experiences on Pink Sands Beach Bahamas can be facilitated by Pink Sands Resort. Of course, a trip to the Bahamas needs to include some kind of water sport. Pink Sands Resort will allow you to wake up, step out of your room onto Pink Sands Beach Bahamas and snorkel all morning. You can book scuba trips too, giving you the chance to head out to the Devil’s Backbone reef or some of the other popular sites. However, there is one activity in particular that you should try when visiting Pink Sands Resort. Nothing says “Bahamian Vacation” like a horse ride along a pink beach. This in itself sounds like a fairy tale, and the experience may certainly blur the lines between reality and dreams. Galloping alongside the magnificent Bahamian ocean along a beach of pink sand is an experience that very few people can say they wouldn’t enjoy, and fewer still can say that they have enjoyed. A trip to Pink Sands Beach Bahamas will give you a chance to be one of the few who can say that they’ve experienced such a unique activity. Though Pink Sands Resort is your best option for accommodation, there are plenty more to choose from. Whether you select another resort along Pink Sands Beach Bahamas, or you stay in Dunmore Town on Harbour Island, your time here is sure to be an enchanting one. Bicycle rides around the island, golf cart trips to the Lone Tree attraction on the northern coastline. This glorious island with pink sand has something for everyone, and a range of fantastic restaurants to suit every palate. 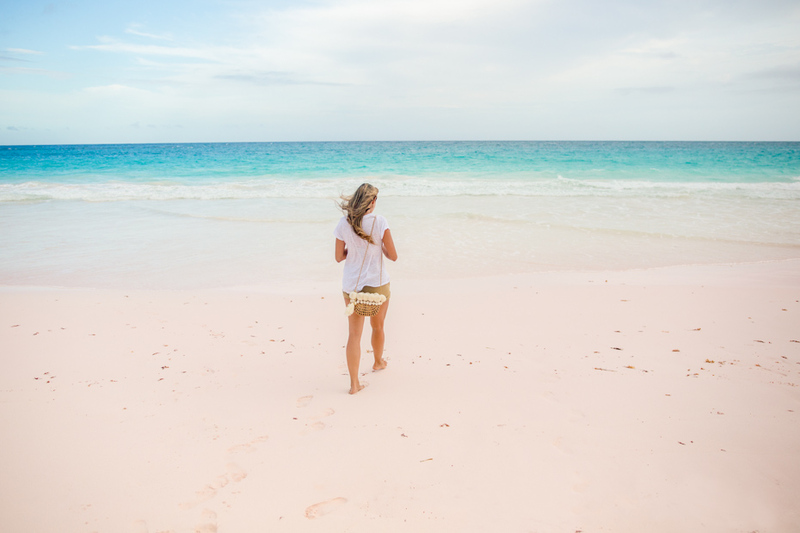 A trip to Harbour Island Bahamas pink sand is an absolute must for any tour of the Bahamas. However, this is even further enhanced by a trip with Bahamas Air Tours. Not only will you view Pink Sands Beach Bahamas as you walk along the water’s edge, but you will also have the chance to view it from above as you soar above this exquisite Bahamian landscape. Seeing the sparkling pink beach below you before exploring it on foot or horseback will give you a far deeper appreciation for the beauty of this destination. Not to mention the ease and convenience of flight, allowing you to make the most of your time in the Bahamas by cutting down on travel time. Bahamas Air Tours will even give you the chance to choose between a number of different packages. From day trips to overnight stays, Bahamas Air Tours gives the people of Florida a chance to explore Harbour Island Bahamas Pink Sand in an entirely new and exciting way. If all you want to see is the beauty of Pink Sands Beach Bahamas, then you will be transported there, however, if you want a more comprehensive tour of all that the Out Islands have to offer, you will enjoy island hopping by plane with Bahamas Air Tours. This will certainly instill the wonder of flight into each passenger as they glide over the Bahamas and appreciate its endless beauty. Booking a trip with Bahamas Air Tours will ensure that you and your friends or family have the trip of a lifetime on this famous island with pink sand.